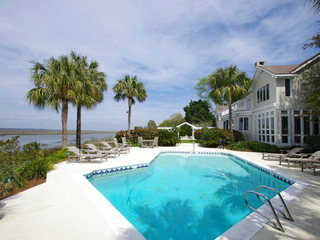 Located in an unincorporated area of Glynn County, Georgia, Sea Island has long attracted visitors to its resorts and residents to its affluent life style. According to Trulia, Sea Island real estate sales prices have spiked by almost 50 percent in the 12 months ending August 2013. The median sales price for Sea Island real estate runs $2,150,000 for an average price per square foot of $606. The average listing price is $3,231, 716. Two-bedroom properties list for $1,205,952, three bedrooms go for $1,903,850, and four bedrooms are at $2,96,163. While Trulia does not provide specific information for Sea Island, it does reveal that 21 percent of the homes in Glynn County were built from 1980 to 1989 with 17 percent constructed from 1970 to 1979 and 14 percent from 1960 to 1969. Sea Island itself does not have any public schools, although several elementary and high schools are nearby. Weichert reveals that the median age for Sea Island residents is 22, with over half having bachelor’s degree, 6 percent with graduate degrees and 11 percent with associate degrees. Over three-quarters of the employed population works at white-collar jobs. Average temperatures range from 75 to 90 degrees Fahrenheit in July and from 43 to 60 degrees in January. The weather is generally mild although the risk of hurricanes in the area is four times the national average. The most distinctive landscapes of the area belong to the marshes, which are home to economically important shrimp, fish, oysters and crabs. The marshes also protect the surrounding lands from storms. If these facts make you want to buy real estate in Sea Island, please contact DeLoach Sotheby’s International Realty today to see what options we can offer you. Five Reasons to Purchase Real Estate on Georgia’s Sea Island!